If there was ever a time for New England Patriots fans to start worrying about the progress of backup quarterback Jimmy Garoppolo, it’s probably now, as Tom Brady, at the moment, is going to be suspended for the first four games of the 2015 NFL Season. The Brady appeal to the league failed, and while he tries to settle things with courts, the Patriots need to make their preparations. Overall it makes sense to think about the future, especially with Brady closer and closer to his final days as an NFL quarterback, suspension or no. Garoppolo, a second round pick in the 2014 draft, had a chance to play in the garbage time of six games. The numbers (70% completion, one touchdown pass, no interceptions) don’t really matter, but there were those calling for Garoppolo to take over for Brady after the first month of the season, as the Patriots slithered to a 2-2 start, including a brutal display in Kansas City. Brady bounced back, Garoppolo had time and media silence to develop while the Patriots won the Super Bowl. The time was used to make Garoppolo understand the Patriots offense, and the next step for him is adjusting to opposing defenses. 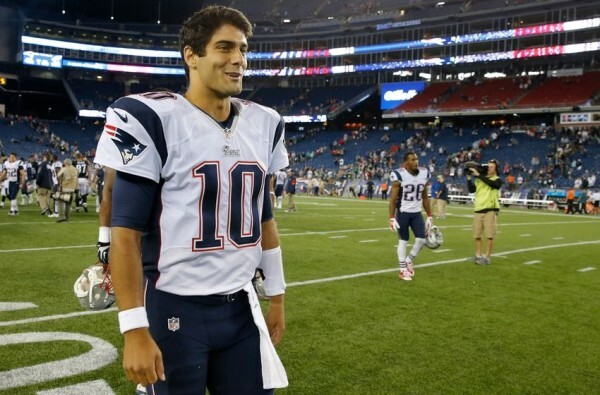 Will the Patriots make it through the first month of the season if Garoppolo does indeed play in Brady’s spot? The Patriots did well with Matt Cassel in 2008 after Brady went down with a season ending injury on the first game of the season. It’s a chance for Bill Belichick to once again prove he can do the most with less, even if Garoppolo isn’t ready to actually start and lead an NFL team successfully.